Normally, I try to avoid touristy restaurants like late-night informercials (unless there isn't anything else to watch...). 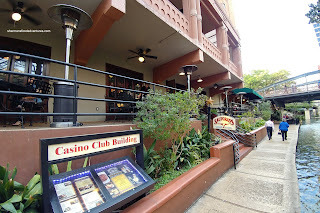 However, we ended up at Saltgrass Steakhouse right on the San Antonio River Walk for a few reasons. First, we needed food since it was already 3:00pm and we were stuck on the Riverwalk. Second, while we were taking the hotel shuttle to Sea-Tec (on route to Dallas), someone recommended the crab cakes at Saltgrass. Lastly, it was happy hour and not only could we get a few bites on the cheap, the drinks were equally inexpensive. We ultimately ordered some of their happy hour specials including the Fried Mushrooms. Okay, for $4.00, this was an obscene amount of mushrooms. They were aggressively battered and fried, but when eaten hot, they were crispy with juicy mushrooms inside. However as they got colder, the batter became mealy and too thick. I had to resort to peeling it off. 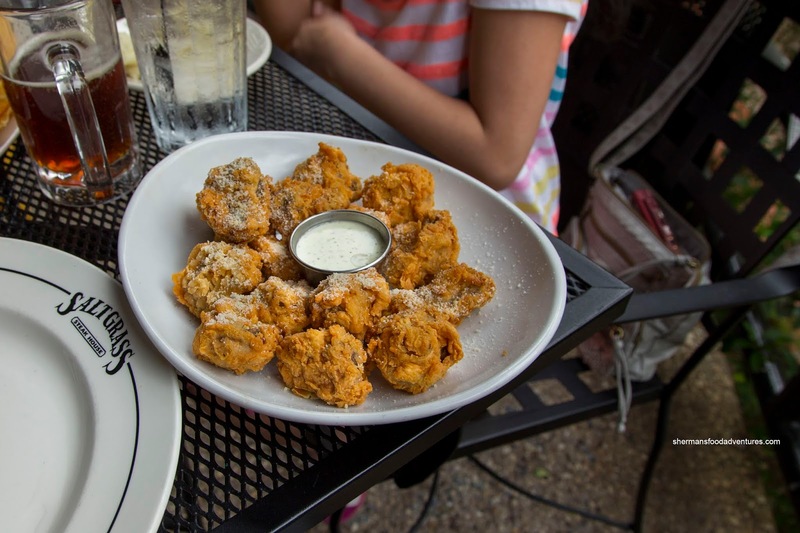 I thought the ranch dip was a good match for the fried mushrooms. 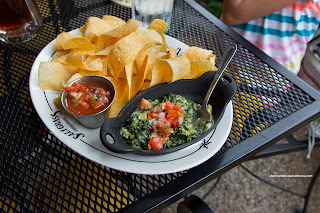 Also on the happy hour menu was the Artichoke and Spinach Dip accompanied by fresh tortilla chips. This was pretty good with large chunks of artichoke and plenty of not-overdone spinach leaves. The mix was creamy and cheesy with just the right amount of seasoning. 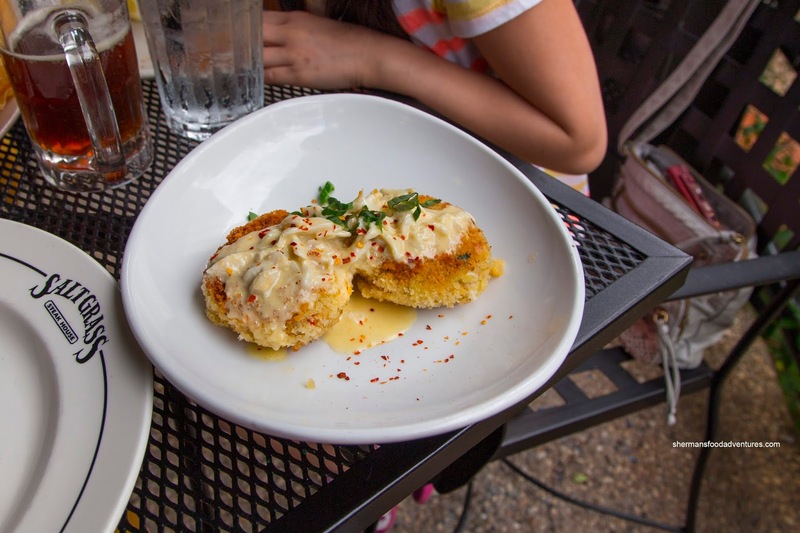 Okay, we did order the aforementioned Crab Cakes and gawd they were enormous. These were breaded, pan-fried and topped with even more crab in a buttery sauce. I found them rather loose though and the breading was not as crispy as I would've liked. In fact, some portions were too soft and rather wet. Despite this, the filling was mostly crab which was fluffy and mildly-seasoned. Were they great crab cakes? No, but they were decent and a good value. My son didn't get very creative and got the Mini-Corn Dogs with fries. These little nuggets were hot and crunchy. 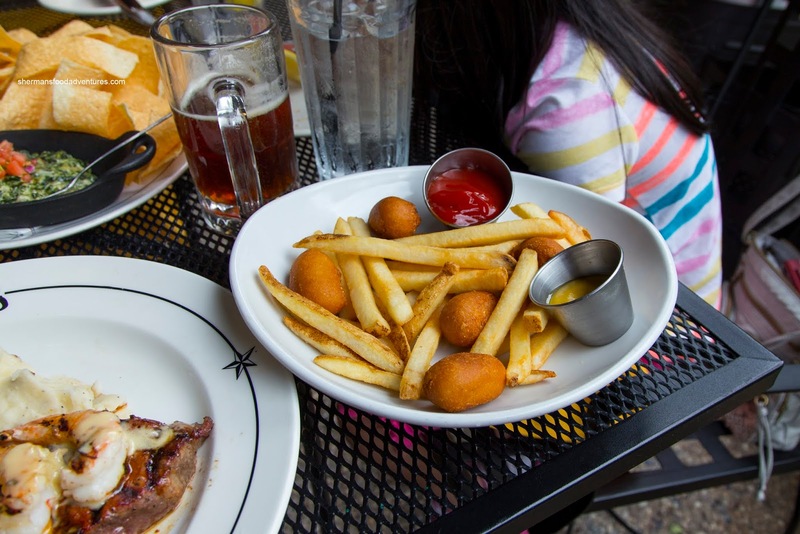 Although the fries weren't anything special, they were fried properly being crispy with plenty of potato texture left inside. We also ordered the Surf & Turf to share which started with a choice of soup. I don't even remember what the other option was, but we went with the Chicken Tortilla Soup. It was surprisingly good despite not looking that interesting. 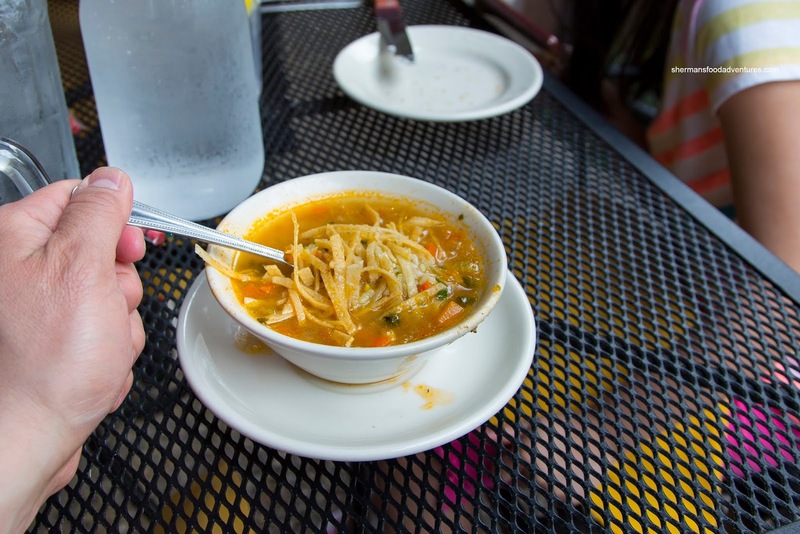 The chicken soup was flavourful without being salty while the crunch from the tortilla strips were pleasing. They didn't soften up too much even though they were sitting in hot broth. 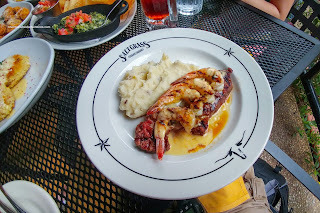 As for the main dish, it was the 10 oz Striploin with grilled shrimp and lemon butter. It was prepared medium-rare as requested while charred enough on the outside for both aesthetics and caramelization. The steak ate well being meaty and tender while the buttery shrimp were perfectly prepared. 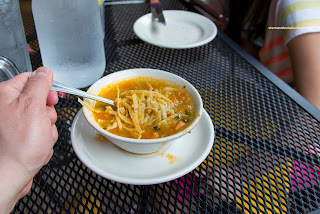 Despite my reluctance to visit chain restaurants while on vacation (there are more interesting things to eat), Saltgrass did the job and satisfied our expectations at the time.